Jackson, Mississippi artist Dolla Black drops episode three of his "Still Black" web series. Episode three is part two of Dolla Black trip to Atlanta. 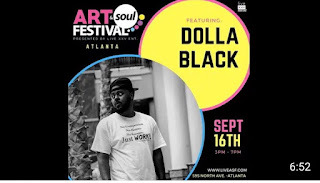 Dolla visits Atlanta for the Live XXV Art & Soul Festival. Appearances by JoDeBoy, AVEVO, DJDMatic, DJRon aka RonThaDJ and KDTheGreat.